This chapter shares seven examples of transdisciplinary practices in the areas of assessment, undergraduate and graduate classroom learning, with accomplished industry leaders, and using educational technology (in the form of a learning management site) to create inclusive communities. The application of the Critical Incident Questionnaire for classroom and program assessment amplifies the voices of diverse students coming from different disciplines to dynamically impact class and curriculum design for broader engagement. Classroom and industry leader examples include integration of image, artifact, case study, reflection, documentary, image and metaphor generation, movement, orchestral music, chosen art forms, leadership studies and practices, experiential learning, writing, speaking, and discussing to create deep learning experiences that provoke growth, creativity, and the building of communities. Undergraduate students with jobs in a multi-department unit report that a planned and creative use of a learning management system for an online work orientation program results in their perceptions of belonging and connection to the work unit and each other. In today’s world, human interaction is continuing to evolve and because of advancements in technological communication that spans the planet, problems are known in a global context, not just locally, regionally or nationally. Educators’ ability to keep pace with technological advances through social networking, collaborative inquiry and problem identification, problem solving, and global efforts to communicate and share practices is more important than ever. If public education is to keep up with private education as an industry, then it is essential to take risks and maintain openness in pedagogy, curriculum and instruction, and to attract faculty who are able to facilitate, collaborate and teach across fields. As the United States cries out for unification, education must model educational practices and endeavors across disciplines. Research, teaching, scholarship and service need not stay in traditional modes. Tradition can continue to be embraced while moving forward and integrating newer models and theories for better equipping students, faculty, researchers and educators for the future. Given the likelihood that communities of the future are all the more diverse, characterized by many demographics and other variables, genuinely connecting individuals and cultures will require transformative leadership and educational practices. This chapter shares some transformative and multidisciplinary practices, in and outside of the classroom, with college and graduate students and with others, which capitalize on transdisciplinarity. The hopes are to heighten cognitive flexibility, social empathy, critical reflection, online community to result in environments of greater inclusion and connection, fostering communities with genuineness, depth and transparency. 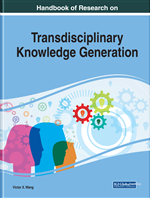 The authors for this chapter reflect the transdisciplinarity that is the focus of this encyclopedia. Each author, in her own learning journey, has gained degrees in multiple disciplines, with valuable ranges of experience that complement and augment the disciplines that we studied. All the authors are rooted in the discipline of education with love of pedagogy, adult learners, and learning design. The interests and experiences range from arts, assessment, communications, educational technology, ethnography, human services, language arts, leadership, psychology, social justice, and spirituality. The authors met each other some years ago through a non-profit focused on integrating arts and leadership, have presented at local, national and international conferences together, in pairs or threes, have designed some amount of sessions and curriculum together, and in some cases worked together academically. The “felt experience” of our multiple disciplines in action together has been extremely enriching and satisfying. Traversing disciplines is natural for those who have multidisciplinary study as a background, and reinforces what neuroscience research suggests about creative and flexible thinking (Mlodinow, 2018) and social empathy (Segal, 2011), both of which contribute to authentic cross-cultural connection, social justice, and transformative educational practice. Adult education pedagogy views students as adult learners who bring with them their histories, previous learning, and experiences. The educator is also a learner, navigating fluidly between roles of instructor, facilitator, and learner. Malcolm Knowles, one of adult education’s most renowned theorists, refers to this way of viewing students and teaching as andragogy (1968). Stephen Brookfield, an adult educator and theorist, intent on understanding diversity in classrooms, developed an assessment tool called the Critical Incident Questionnaire (CIQ) (Brookfield, 1995).